Summary: When you’ve been kept caged in the dark, it’s impossible to see the forest for the trees. It’s impossible to see anything, really. Not without bars . . .
Andrew Winston Winters is at war with himself. He’s part Win, the lonely teenager exiled to a remote Vermont boarding school in the wake of a family tragedy. The guy who shuts all his classmates out, no matter the cost. He’s part Drew, the angry young boy with violent impulses that control him. The boy who spent a fateful, long-ago summer with his brother and teenage cousins, only to endure a secret so monstrous it led three children to do the unthinkable. Over the course of one night, while stuck at a party deep in the New England woods, Andrew battles both the pain of his past and the isolation of his present. Review: Charm & Strange is a difficult, disturbing read. I can’t say much about it without spoiling the story, but I’ll do my best. The bio on the dust jacket says that the author is working on a doctorate in clinical psychology, and it’s clear that Kuehn has used her education to her advantage in this book. 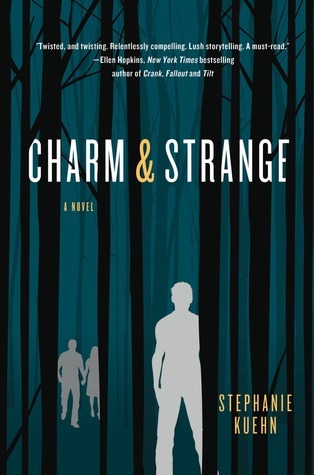 Charm & Strange combines two narratives in alternating chapters: Drew’s traumatic childhood and Win’s reluctant party attendance, which eventually turns into a mental health crisis. Both narratives leave you with a mounting sense of dread the closer you get to unraveling the mystery of what happened to Drew/Win. There are enough clues that a discerning reader can figure out the key points of the trauma before the official reveal, but that won’t lessen the emotional impact of the events. I spent the time before the reveal desperately hoping that I was wrong and the time afterwards being extremely upset that I was right. While the book remains tightly focused on Drew/Win, Lex (a former roommate) and Jordan (the new girl) are scene-stealers at school. The failure of Win and Lex’s pseudo friendship is a painful but necessary way of highlighting just how messed up Win is. Jordan’s attempts to befriend Win are equally hard to read, especially since I wanted Win to reach out to someone for help. Lex and Jordan are two decent people caught up in the life of a very broken person, and I admire them for how they deal with Win. They also keep the present narrative from being completely soul-crushing. Unfortunately, the past narrative is completely soul-crushing. It’s clear from the start that some pretty terrible things had to have happened to Drew in order for him to grow up to be Win, and I had to mentally prep myself for every new chapter. These chapters are the most powerful, especially when the reader starts picking up clues about what is going on with Drew and his family. His brother, Keith, features prominently in this part of the story. The relationship between Keith and Drew (and to a lesser extent, their younger sister, Siobhan) is a heartbreaking one. Keith often acts as a parent for Drew, despite only being a few years older, and watching him struggle to be an adult when he shouldn’t have to be is emotionally draining. Recommendation: Get it soon, but only if you think you can handle disturbing subject matter. Kuehn wrote an excellent book, but I honestly don’t think I’ll be able to reread it. The book is short and powerful, and it leaves you reeling. Rich in Color is dedicated to reading, reviewing, talking about, and otherwise promoting young adult books (fiction and non-fiction) starring or written by people of color or people from First/Native Nations. You can find us on Tumblr, Twitter, and Instagram!